Though stuffy nose is a maddening condition and poses a negative impact on daily routine work if treated wisely can be cured within a few days. What you need is to concentrate on good nutrients and offending irritating food from the regular diet. There is observed a loss of appetite in this condition however juices or smoothies serves the finest approach to encounter it. After stuffing myself in many days of research now I bring forth an exciting recipe that will definitely work for you so must give it a try. ⇰Carrots are very effective in dispelling nasal congestion. ⇰Ginger is being used in many traditions for medicinal purposes; its role is very effective in treating the inflammatory condition and respiratory infection. It reduces inflammation in airways thus broadening them and eases you to breathe properly. ⇰Apple cider vinegar poses high PH levels that enable it to break down mucus thus cleanups air passage that reliefs you from stuffy nose. ⇰All members of the citrus family are well-known to combat infectious conditions same as the case with lime, it is loaded with a high content of vitamin-C that acts as an anti-oxidant and fight off infections. ⇰Celtic sea salt is very beneficial for people fighting with sinus infections, bronchitis, allergies, congestion, and asthma. It hinders mucus accumulation, therefore, comforts in breathing issues. Have it regularly till you see improvement in your health condition. Restricting offending foods is the key to cure otherwise all remedies go useless. If you sip this smoothie and close our eyes, you can transport yourself to a tropical beach. • 1 tsp apple cider vinegar. • A slice of ginger. Place all of the ingredients in a blender, and mix until smooth. 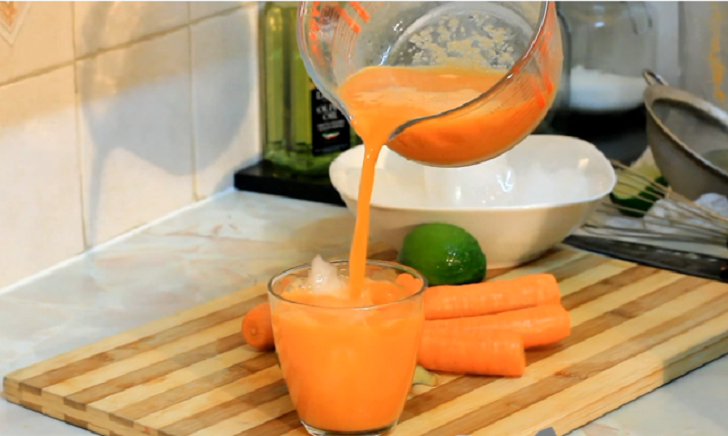 Using freshly juiced carrot juice is recommended.